Nick Morton and Chris Vail considers themselves “liberators of antiques” for profit. In lamens terms, they rob ancient burial sites for money. Nick uses a one-night stand to steal a map from Jenny. This map contains the location of Princess Ahmanet. Princess Ahmanet was the heir to the throne until her father had a son. The princess knew the throne meant power and she wanted all for herself. So Ahmanet made a deal with the God Set, the god of death. She would sell her soul for power and bring God Set into the mortal world. She kills her father and brother; then prepares to kill a mortal for Set to inhabit. But she is stopped and mummified alive. Nick and Chris unearth the burial site. Jenny is pissed but looks around. She notices the differences in this burial site. The statues are facing the wrong direction and its covered in mercury. Jenny realizes this site isn’t a tomb, it’s a prison. But with one shot, Nick unearths the sarcophagus and starts to see visions. Ahmanet thanks Nick for freeing her and calls him “My Chosen”. Nick shakes off these visions and proceeds to put the sarcophagus on a military plane with Chris and Jenny. Once in the air, the plane starts to go down. Nick saves Jenny but dies in the crash, well, for a moment. In the morgue, Nick jumps off the table and shocks everyone. He only has one thought in mind: find Ahmanet. But finding her will only reveal that Nick is in a fight for his life and soul with Dr. Henry Jekyll and Edward Hyde at the helm. Sometimes a good idea doesn’t need to be remade. This mash-up of The Mummy (1999) and The Mummy (1959), just a lot worse. The graphics are basic for this series, the action is overdone, and the overall acting is a bore. The zombies are half mummy and half Gollum, which doesn’t make them scary. Just comical. The ending is predictable and disappointing. The only saving grace is Crowe as Dr. Jekyll/Mr. Hyde. His scenes saved this downfall of a movie. Also, Johnson was a magnificent, albeit normal, comic relief. Although this script didn’t need it because there was no tension or anything frightening. This movie should be skipped at all cost. Wait for basic cable to see this one. By the way, there is nothing after the credits, thankfully. Megan is in a state of depression after losing her friend and her job. She decides to leave her past behind and join the Marines. While she is advancing in the Corp, she hasn’t left her partying past behind. She is caught peeing next to the barracks of an officer after getting drunk. She is put on “crap” patrol literally by cleaning dog cages. Then she is asked to be the decoy while training the dogs to attack. When cleaning the cages, she meets Rex. And Rex snaps at her. Rex is the most untrainable dog in the unit and bites his handler, breaking 6 of the bones in his hand. With the handler out, Rex is assigned to Megan. With patience, Rex warms up to Megan and starts to follow orders and find explosives. With a few months of training, Megan and Rex are deployed. Rex and Megan are making great progress in the ranks but with 1 more month left in her tour, both are injured when an IED explodes. Megan is sent home but Rex stays behind. While in rehab, Megan worries about Rex until he comes home and they are reunited. Megan decides she wants out of the Marines but she learns she can’t adopt Rex because he is too fragile for civilian life. And if he can’t be adopted after his military life is over, he will be put down. But once a Marine, always a Marine. So, Megan will fight to not leave Rex behind and adopt him. Based on a true story, this is not a tale about a woman and her dog. This is a tale about two soldiers that fight the after effects of war. This movie sends a quarter of the time endearing you to Megan, half the time ensuring you understand the connection between Megan and Rex, and the last part showing Megan fighting to get Rex back. You will get to see other dogs and their handlers but the tough seen is when a soldier doesn’t return. But his dog does. Seeing the dog still look for its handler is rough. It proves they aren’t just Marines, they are truly family. This is a good uplifting movie for the matinee price. And for dog lovers, be prepared to get misty eyed. Phillip was orphaned at a young age but raised by his cousin Ambrose. Years later, Phillip comes back from school but he only learned to dislike books, the city, and smart alecs. He decides to stay with Ambrose and help him run the town. However, Ambrose is sick and the doctor tells him to go to Italy to get better. As time moves on, Phillips gets several letters from Ambrose. The letters state he feels great has met a woman named Rachel and got married. Although later, his letter stated that he fears Rachel and believes she will kill him. Phillip goes to find Ambrose, only to find he has died and Rachel left. Heartbroken, Phillip returns but he is on a mission to find Rachel and confront her. He puts the word out that he is inviting Rachel to return to stay with him. He would because they are family. Soon Rachel comes to Phillips home and stays, but Phillip is enticed by the bewitching woman and wants to give her the world. And he does. But with everything he gives, she takes and he gets sick. Will Rachel be his demise? 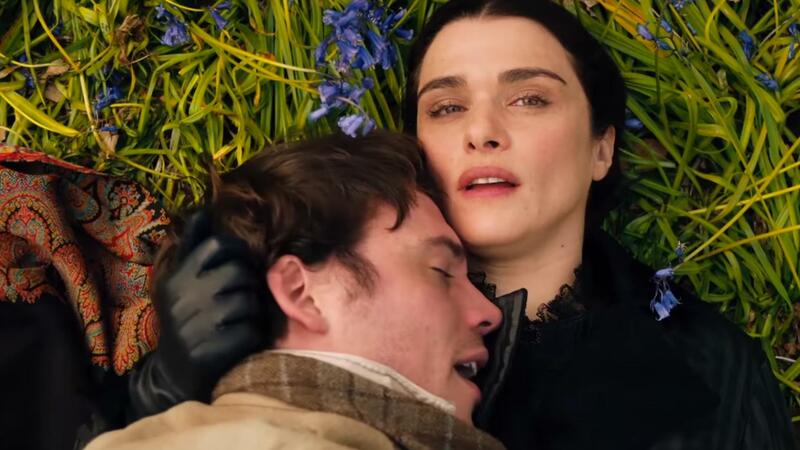 Based on the book, My Cousin Rachel by Daphne du Maurier, as well as the 1952 remake, this movie is better suited for Lifetime (FTC Affiliate Disclaimer). While the cinematography and costume are deserving of an award, the story is slightly compelling but not original. Also, it ends with a question that will plague the watcher. Wait for Redbox or read the book, unless you like period movies. Otherwise, this movie has nothing new to offer. #JohnWick2 – Review Repost – In Stores Now!! !